JERUSALEM -- A Palestinian youth sneaked into a fortified Jewish settlement in the West Bank on Thursday, broke into a home and stabbed to death a 13-year-old Israeli-American girl as she slept in bed before frantic security guards arrived and killed him. The girl, identified as Hallel Yaffa Ariel, became the youngest Israeli victim of a nine-month wave of violence that has seen dozens of Palestinian attacks. The early-morning stabbing, carried out by a 17-year-old Palestinian high school dropout, was among the most brazen attacks so far, drawing angry accusations and calls from Israeli leaders for the world to condemn the incident. 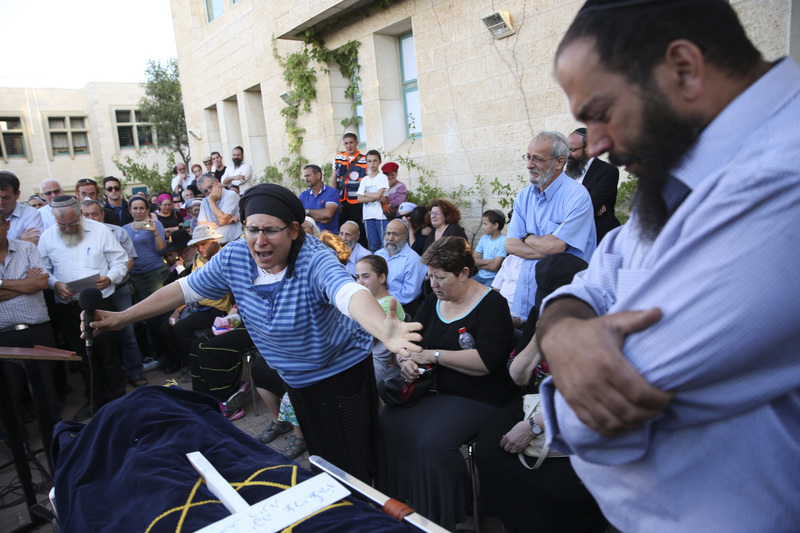 "The horrifying murder of a young girl in her bed underscores the bloodlust and inhumanity of the incitement-driven terrorists that we are facing," Prime Minister Benjamin Netanyahu said. "The entire world needs to condemn this murder, just as it condemned the terrorist attacks in Orlando and Brussels." In Washington D.C., U.S. State Department spokesman John Kirby condemned "in the strongest terms the outrageous terrorist attack" and called the stabbing "unconscionable." Kirby said Hallel was also an American citizen. Israel has a large community of dual American citizens, numbering in the tens of thousands. Lt. Col. Peter Lerner, an Israeli military spokesman, said the attacker got past a fence surrounding the West Bank settlement of Kiryat Arba and quickly made his way to Hallel's home. He said it was not yet clear how he entered the home, but that he locked the front door from the inside to prevent rescuers from getting in. Israel's Channel 2 TV said the settlement's private security guards had spotted the Palestinian youth as he infiltrated the settlement and rushed after him to the home. But by the time they arrived it was too late to save Hallel. The settlement's security chief, Eyal Gelman, told the station that the girl's father, who was a member of the security patrol, had a key and opened the door. The guards shot and killed the attacker, though one of the security men was stabbed and wounded in the standoff. Photographs released by the Israeli government showed a pool of blood in a colorful children's bedroom. Hallel was a relative of Israeli Cabinet Minister Uri Ariel, a member of the "Jewish Home" party, which is affiliated with the West Bank settler movement. After the attack, Ariel said Israel would make "every effort" to expand its settlements in the West Bank. Kiryat Arba is a hard-line Jewish settlement of about 7,000 residents, located near the West Bank city of Hebron that is home to about 170,000 Palestinians. The city has been a frequent flashpoint of violence. Hundreds of people, including several senior politicians, attended the girl's funeral later Thursday. "You were the light of my life," said her mother, Rina Ariel. "Farewell, sweetheart. Have one last hug from mommy." The Palestinians claim all of the West Bank, captured by Israel from Jordan in the 1967 war, as part of a future independent state. The Palestinians and the international community consider the settlements to be illegal or illegitimate. In a second incident later on Thursday, a Palestinian assailant stabbed two Israelis in the coastal city of Netanya before he was shot and killed by an armed civilian. The Israelis were reported to be moderately wounded. The assaults were once near-daily occurrences, but have slowed in recent months, though they have not stopped. On June 8, a pair of Palestinian gunmen killed four Israelis in a popular Tel Aviv tourist district. Israeli officials say the violence is the result of anti-Israeli incitement by Palestinian leaders and in Palestinian social media. Lerner, the military spokesman, said that Thursday's attacker in Kiryat Arba had been active on Facebook lately, praising previous deadly attacks on Israelis. Palestinian officials say the violence is the result of despair after two decades of failed peace efforts, and a lack of hope for gaining independence after nearly 50 years of Israeli occupation. They also accuse Israel of using excessive force, killing attackers who could have been stopped and in some cases, killing innocent people. Last week, the Israeli army acknowledged that it had apparently shot and killed a Palestinian youth in the West Bank by mistake. Israeli security forces have had a difficult time stopping the attackers, largely because they tend to be young assailants, often in their teens or early 20s, acting on their own and not sent by organized militant groups tracked by security agencies. The Kiryat Arba attacker seemed to fit that profile. The Palestinian Health Ministry identified him as Mohammed Tarayreh, 17, from the Bani Naim village near the settlement. The Israeli military quickly cordoned off the village and searched the family's home. Netanyahu said that Israel would revoke Israeli work permits for family members and make preparations to demolish the family home - a controversial tactic that critics say is unfair collective punishment. Adnan Tarayreh, a cousin, said Mohammed had dropped out of school and was working in a bakery. He speculated the teen may have been spurred to action after the death of a cousin who was killed while attempting to ram his vehicle into Israelis in Kiryat Arba several months ago. Tarayreh's mother, Um Kamel, said soldiers had entered the home and questioned several family members. She said she had no idea that her son had planned the attack, but appeared to be proud. "I know when someone sneaks into a settlement he is a hero, but I didn't know that my son is bold to this degree," she said. The attacker's uncle, Rajeh Tarayreh, later said the family is hosting a celebration that's a tradition for every "martyr" killed by Israel, complete with national songs and accepting visitors offering congratulations. "He did something he was totally convinced of," he said of his nephew. "Yes, he might have killed a small girl, but Palestinian kids are being killed too." Palestinian President Mahmoud Abbas did not comment on the attack. He has spoken out against violence in the past, though Israeli officials say his apologies have been half-hearted at best. At times, they have accused him of making comments amounting to incitement. A growing number of Israelis believe the roots of the violence go much deeper, and say the lack of hope over a stagnated peace process is driving the unrest. "People need to see a light at the end of the tunnel," retired Maj. Gen. Gadi Shamni told Israel Radio. Shamni is among the authors of a new report, endorsed by more than 200 retired security commanders, urging Israel to take steps to improve the political climate and Palestinian economy to create conditions for a final peace deal. Palestinian political science lecturer Ahmad Jamil Azem at Birzeit University said the past months of violence have persisted because young Palestinians have felt exasperated by Israel's ongoing military occupation and a weak Palestinian leadership. "We don't have anything," Azem said. "Nobody has a political vision."